Canet d'Adri sits in the hills behind Girona that separate Girona from Olot and includes the outskirts of the Garotxa, the land of ancient volcanoes formed when the Spanish Penisular (which is geologically part of Africa) ran into the European continental plate. It's an area we haven't explored very much, so a bright sunny Boxing Day seemed a good chance to walk off Christmas Dinner and to try off a new walking map of the Girona area from the ICC and it happens there's a 'green star' on the map indicating 'natural curiosity, beauty spot' - the Gorgues de la Font de la Torre. Walking a new area without really knowing what the routes are is always interesting - sometimes it's just pot luck as to whether we find something worth visiting or just discover there would be somewhere better to walk for next time. We park just across the road from the old Ajuntament building and walk down the lane towards the river. The map marks two bridges as being of interest and we walk down to the first one. 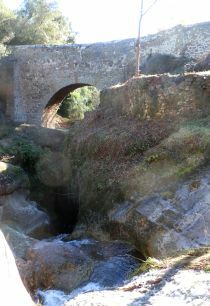 The bridge isn't so interesting, but it sits above a rocky gorge. From the map we had wondered if we could make a route along the river, but the path is marked as private, so we have to go back up towards the village and follow the official footpath past mainly newer houses and a new looking sports centre. The path down to the Font de la Torre is easy to find beneath a large old almost warehouse-looking masia, and steps take us down to rocky pools, waterfalls and two streams cutting through the rock in narrow gorges. The area is obviously popular and metal rails run along side the paths. 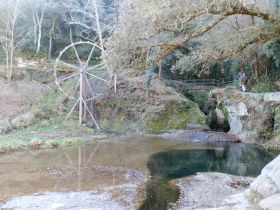 On the opposite corner is a large waterwheel standing above the water now as decoration rather than a working wheel and some of the pools are deep and clear with vertical sides. Under an old bridge, the streams fall away in a series of water falls down through the cut to a river below. Having chased across the rocks and pools and along the streams, we decide to try to follow the stream at the back into the woods and hills. The path is narrow and haphazard and we skip across the rocks to the other side of the stream to try to find a better route, but the path is the same. The sides are initially like walls but with large ferns growing out of them giving the path a jurassic feel. As we continue, we're not so sure if the path we're walking really is a path and not wanting to get too deeply into the woods and hills as this is a relatively remote area with few roads or routes, we find a path up the side of the stream to the right and reach a forestry garage/picnic area and a track that takes us out to the road close to Can Canet. We take the track back down before taking a left towards Can Nadal (it is Christmas). This looks like a colonies house and as we get closer we follow the sign that points to Administracio and up into the woods. The idea for the second part of the walk is to visit the old volcano just behind Canet d'Adri, but the paths aren't too clear. We follow the track at the back of Can Nadal into the woods until it emerges at a newly ploughed field. Someone has driven across the field and so there is a track, and the track exists on the map so we chance it and reach the woods up on the far side. The path takes us past Can Pou (Pou is a well in Catalan), through the woods and out at more of a road on the other side. As we emerge we see the sign from the road says the track we were on was a Pas Particular - a private road. This is something we find regularly - an open path from one end is marked as private from the other. 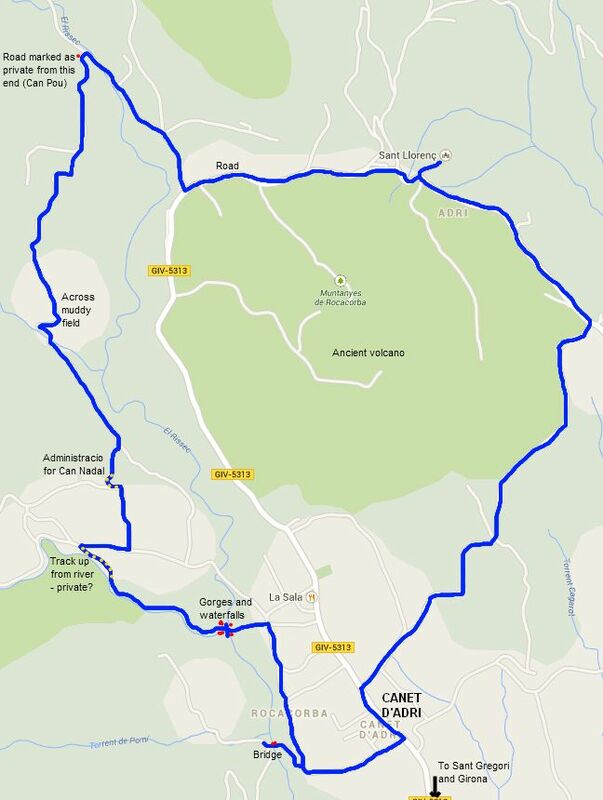 Unfortunately the maps don't distinguish between private and public tracks or routes. We continue down the road to the back of the volcano. As we reach the junction we see the signpost for a bigger walk up to Rocacorba and Puigsou. Looking up we can see the arial masts above the cliffs on top of the mountain behind us - so something for another day. We're at the back of the Puig of the old volcano and there are several families walking so we follow the road around the back of the Puig (it means 'hill' in Catalan). 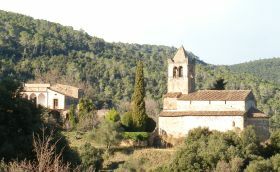 There are many isolated masia farmhouses and as is common around Girona, several have been restored as large family restaurants. Sunday lunch at a country masia is very popular for locals - much more than going to the coast or eating in town. We keep following the road around to Adria a small hamlet of large old houses and a small church that stands above a wooded valley. In the distance we can look out to Girona and the Gavarres. The houses are built in the traditional golden stone of the region and many have been fully restored. Though there is a route up to the puig, according to the map there are no routes over the puig and down the other side so we stick to the road as it curves around the base of the Puig finding rocks of pumice along the side of the road. We pass through woods and have more views towards Girona and see the newly erected pylons for the MAT electricity line that is going to be bringing electricity from France as far as Barcelona. MAT (Molt Alta Tensio) is controversial because of the visual impact of the pylons and lines and there are many 'no-MAT' signs and posters in this part of Girones. This is the first time we've actually seen the pylons and they are larger than normal, but not the only pylons in the landscape. Around the hill we return to Canet d'Adri. 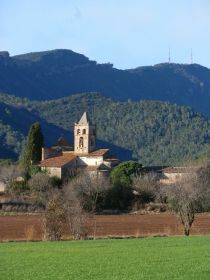 We would normally visit the village centre and church, but the older part of the village looks to be just the church and a house, so we return to the car and back towards Girona.